If you find yourself unable to find a LARP sabre that has a handle and blade combination you like, maybe creating your own foam-latex blade is the project for you! Make the project easy by using the DIY LARP Sabre Handle - Painted! Made from a polyurethane foam cast, this durable handle has already been painted, saving you the painstaking process of hand painting minor details onto it. 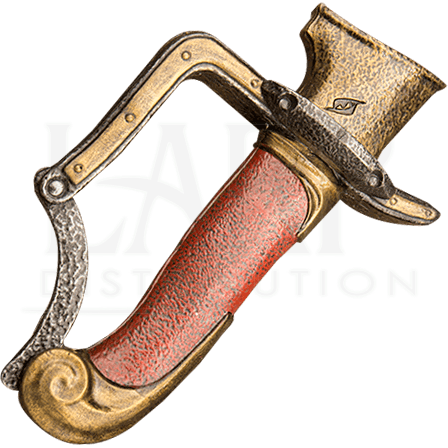 The sabre handle possesses a D-guard and has been painted to possess a golden tone with a leather colored grip that ends above a curled pommel. The strength of the material that the handle is made from means that it requires virtually no maintenance and it will last longer than a regular latex foam handle. It is also safe enough to use in LARP combat and is approved by the top LARPing organizations! Just add your custom blade to this LARP sword handle and create the sabre of your dreams!